Inga Tritt founded The Original Little Sprout in 2003 and Original Sprout in 2007. The name Little Sprout was inspired by the birth of her daughter Maya. As a new mom, Inga wanted to use the safest, natural products which led to her trying natural baby shampoos. To her surprise, all the shampoos wreaked havoc her daughter's hair and sensitive skin. To remedy the problem Inga created the first of it's kind, ultra moisturizing natural baby bath and styling products that were free of harmful chemicals and made with natural, organic ingredients. Original Sprout has been featured in Original Sprout products are featured in many major beauty, fashion and parenting magazines throughout the world. They have a cult following of the who’s who in green Hollywood, thousands of salons, and women who want high-quality, safe products for themselves and their family! They sent me their Worry-Free Luxury Collection which includes their best-selling Miracle Detangler, Natural Shampoo, and Scrumptious Cream. Here is my review. This a natural shampoo you won't regret buying! The Original Sprout Natural Shampoo is a new and improved sulfate free formula with added sun protection. Organic emollients detangle and make rinsing effortless, saving time and water. It nourishes your scalp, hair and skin without phototoxic and estrogenic essential oils. It leaves hair shiny, hydrated and easy to comb. This is one of the best natural shampoos I've tried and I was pleasantly surprised with the results! I used it on myself and my little one and I noticed a significant improvement in our hair. Our hair was left feeling smooth, hydrated and super shiny, not dried out like other natural shampoos we've used in the past. So Moms, you can feel good about using this shampoo on you and the entire familiy. This shampoo is also available in a large 33oz. size for the whole family. It's 100% Vegan and made with natural and organic ingredients. I highly recommend this natural shampoo for the whole family! The champion of all detanglers! The Original Sprout Miracle Detangler is a professional, quick release formula makes tough tangles history. It's a number one selling Professional Miracle Detangler and it really works! I found this product to be exactly what it says "A Miracle Detangler" for our hair. It worked wonders on our thick, dry hair. I find it works the best on my little one who gets frizzies throughout the day. I love this product because it works on me and the whole family! It really makes combing time on my little one effortless and fuss free. I also use it for touch ups on us to fight frizz throughout the day. This detangler also comes in a large 12 oz size, is made with natural and organic ingredients and is 100% Vegan. It's free of Formaldehyde & Lye as well as other harsh chemicals like Hydantoin DMDM & Sodium Hydroxide found in many children's detanglers. You can use any time for a freshly washed feeling and to calm those frizzes and completely detangle hair. 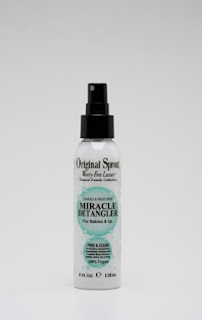 I think this miracle detangler is definitely a "must have" for the whole family! Scrumptious Baby Cream is lovely and works for the entire family! It's a body cream, not a sunscreen. But it's soothing protective barrier keeps skin soft and smooth as velvet. The multi-benefit cream is infused with natural zinc for added sun protection plus organic rosemary for added benefits. It's non-greasy and extra hydrating and works for all skin types. This body cream is made with natural and organic ingredients, is 100% Vegan and also comes in a larger 8oz. size. Moms can feel good about using this body cream on their babies and children. It leaves our skin silky, soft and super hydrated. My little one has sensitive skin and this body cream didn't cause any reactions like other body creams do. In fact, I even put it on his face and had no issues at all. This is the first product that hasn't caused a reaction on his face from so I was thrilled! It's the perfect baby body cream but also works for children, teens and adults too. Give it a try and I know you'll love it as much as I do. If you're interested in trying The Original Sprout, use code FIRST_ORDER_10-U at check out to get 10% off your first order! Be sure to follow Original Sprout on Twitter and Facebook. I will must try this...And i hope it will be really good for the dry skin!!! thanks for the posting!